Mounting systems for the bathtub rim area are used, firstly, as a stable support system for bathtub rim fittings. Secondly, they offer protection against mould growth under the bathtub, as they catch the dripping water that inevitably seeps out at rim valves along the hose penetration. 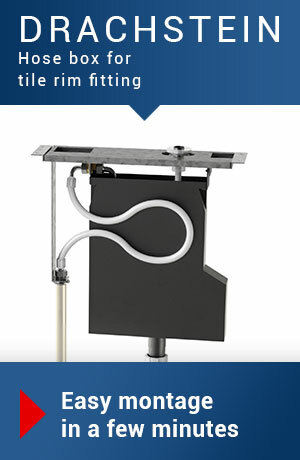 Mounting systems for bathtub rim fittings are installed under the tile rim next to the bath and act as an invisible helper. They house the complete fitting of the bathtub and offer a stable framework for 3- to 5-hole fittings from any manufacturer. Hose boxes are ideal for mounting the shower hose on acrylic bathtub rims. They provide a 100 per cent security against dripping water from the shower hose. 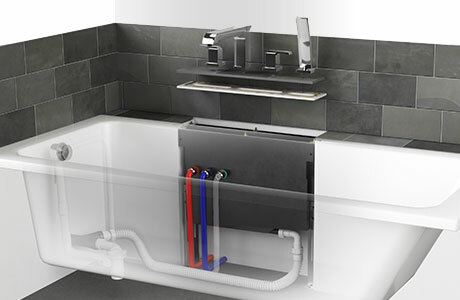 The hose box is ideal for use with concealed fittings. It is possible for bulk buyers to have the models adapted to their individual requirements on request.